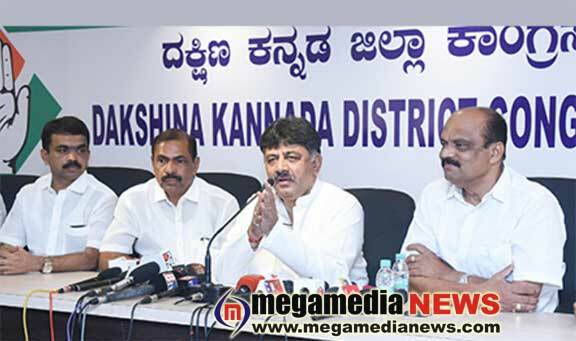 Mangaluru: In last two terms BJP candidate Nalin Kumar Kateel nothing has done for DK constituency said Senior Congress leader and Minister for Water Resources D. K. Shivakumar. Speaking to the reporters at District Congress office on Monday, April 15, he asked Nalin Kumar Kateel to show his performance report over his last two terms. “Nalin Kumar Kateel should reveal his contributions to the Dakshina Kannada district before seeking votes from the public, he said. Nalin Kumar has failed to bring any major projects to this constituency. Around 62 per cent of educated people from Dakshina Kannada district are migrating to other countries and states, seeking jobs. Hence, why should people vote for Nalin Kumar Kateel again , he questioned. People have lost trust upon the BJP government. Hence, people would definitely prevent the BJP from assuming power this time”, he said. MLC and district Congress president Hareesh Kumar, former MLA Moideen Bava and other Congress leaders like Mahabala Marla, Shashidhar Hegde, Bhaskar K, Purushotham Chithrapur, Naveen D’Souza, A. C Bhandary, A. C. Vinayraj among others were present.